Though he is now deceased, California racehorse owner Jess Jackson (as in Kendall-Jackson winery) has had a lasting impact on horse sale law. Frustrated with the common horse racing industry business practice of agents receiving undisclosed commissions from both buyers and sellers (creating an obvious conflict of interest), Jackson took action. In 2006, with significant support from Jackson, Kentucky passed a law making undisclosed dual agency unlawful. In 2010, Florida’s Department of Agriculture enacted regulations governing disclosure in horse sales. In 2007, a bill authored by Jackson-owned Stonestreet Stables and introduced by California Senator Patricia Wiggins proposed expanding California’s existing horse sale disclosure law which had been in effect since 1994, Section 19525 of the California Business and Professions Code. The proposed expansion would have Section 19525 apply to all horse transactions, not just those in the racing industry, and give the law more teeth by expanding the recoverable damages and providing that successful litigants could recover their costs and attorneys’ fees. The legislative history notes that the intent of the proposed bill was to “provide a reliable written record of horse transactions and punish…those who use equine transactions to defraud.” The bill never made it out of committee. In February 2009, Senator Wiggins quietly reintroduced the bill. This time, it met with a lot less opposition. The bill was amended, however - to eliminate the proposed right of a wronged party to recover their expenses and attorneys’ fees and to potentially reduce the amount of recoverable damages. Both of these changes had the practical effect of making it significantly less attractive for wronged parties to pursue legal action, as they would have to pay their own attorneys’ fees and expenses, and the potential lawsuit award might be lower than originally proposed. On August 6, 2010, new Section 19525 of the California Business and Professions Code went into effect. Q: What horse transactions are covered by the new requirements? A: California sales, purchases and transfers of show horses or racehorses, including prospects, breeding stock and breeding rights to stallions. Q: I don’t live in California. So, the statute doesn’t apply to me, right? A: Not necessarily. Here are some situations where the statute would likely apply: (i) you sell a horse to a buyer in California; (ii) you buy a horse from a California seller; (iii) you act as an agent for a California buyer or seller; (iv) you receive a commission in connection with a horse sale or purchase that took place in California, or where one of the parties lived in California. 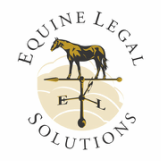 Q: I’m selling a horse in California – what does the law require me to do? A: Provide the buyer with a written bill of sale that includes the purchase price and is signed by the seller and the buyer (or their authorized agents). If you pay a commission (or anything worth $500 or more) to the buyer’s or seller’s agent in connection with a sale, you must: (i) provide a written statement describing the commission or item of value to the person whose agent will receive it and (ii) the person whose agent will receive the commission or item of value signs the statement or otherwise agrees in writing. Q: I’m a trainer who often helps clients buy and sell horses. What should I be aware of? A: You can’t act as agent for both the buyer and the seller unless, before the transaction occurs: (i) you tell the buyer and seller you’ll be representing both of them and (ii) both the buyer and seller agree in writing to have you represent both of them. If you represent the buyer and/or seller in a sale, you can’t accept a commission or anything else worth $500 or more in connection with the transaction unless: (i) you provide the person you’re representing with a written statement describing what you’ll receive and (ii) the party you’re representing signs the statement or otherwise agrees in writing. Even if you aren’t representing the buyer or seller, if you pay a commission (or anything worth $500 or more) to the buyer’s or seller’s agent in connection with a horse sale, you must: (i) provide a written statement describing the commission or item of value to the person whose agent will receive it and (ii) the person whose agent will receive the commission or item of value signs the statement or otherwise agrees in writing. You won’t be able to enforce a commission agreement unless: (i) the agreement is in writing; (ii) the person required to pay you has signed the agreement; and (iii) you met all the disclosure requirements for agency and commissions. Q: What if I sell my horse at auction – do I still need to provide a bill of sale? A: No, as long as the receipt delivered by the auctioneer identifies the buyer and seller and specifies the purchase price. But, note that the agency and commission disclosure requirements still apply. Q: I bought a horse in January 2011 and just found out the seller paid my trainer $1,000 to close the deal. The horse has been lame ever since I bought him. Can I return him? A: Although you may have other legal grounds for rescission, this statute doesn’t provide for it. However, at a minimum, if you were to sue your trainer and the seller in connection with the undisclosed $1,000, you could potentially recover $3,000 (3x the undisclosed commission amount) under the statute. Further, because the horse you purchased was lame, you may also be able to recover $9,000 (3x the purchase price) and three times the expenses you have incurred as direct result of purchasing the lame horse, such as veterinary expenses related to the lameness. Q: In September 2010, my trainer sold my show horse and told me she got $25,000 for him. I ran into the buyer at a horse show and learned that the buyer paid $50,000 to my trainer. Does the statute provide any recourse for me? A: Yes. While the $25,000 difference between the actual sale price and the price your trainer gave you is not technically a “commission,” if your trainer retained that $25,000, they received compensation in connection with the sale that wasn’t disclosed to you. Therefore, pursuant to the statute, you could recover up to $75,000 from your trainer (3x the undisclosed compensation amount). Q: Same question as above, only the sale took place before August 6, 2010. Can I recover damages under the statute? A: No. With respect to show horses, the statute applies only to sale transactions that occurred on or after the effective date of the statute, which was August 6, 2010. But, you may have other legal grounds to sue your trainer, such as fraud and breach of fiduciary duty. Q: I’m really mad at my trainer for lying to me about the sale price and want to go after him for the $75,000 that the statute would allow. However, a lawyer I consulted told me that it would cost $50,000 or more in attorneys’ fees if my case went to trial, and he wants a $20,000 retainer up front. Can I get my attorneys’ fees back? A: This statute doesn’t provide for recovery of attorneys’ fees and costs. However, consult with your attorney about whether there may be other statutory grounds, such as applicable fraud statutes, for recovery of these expenses. If the answer is “no,” it may not be cost-effective for you to sue your trainer. Q: I’m a trainer and recently flew to the Netherlands and helped my client select a horse. My client paid me a 10% commission on the sale price, plus my expenses for the trip, all of which were agreed upon in writing by me and my client in advance of the sale. While I was looking at horses for my client, a representative from one farm said they would “give me something to make it worth my while” if my client bought a horse from their farm. At the time, I thought it was just sales talk, and ignored it, particularly because they never mentioned an amount. My client did end up buying a horse from this farm. A month later, I received a nice note from the farm owner, along with a $1,000 check. Can I cash the check? A: Only if you disclose the check in writing and your client agrees in writing that you can accept the $1,000. Q: I’m a trainer and just realized I violated the statute, but I didn’t know it existed until I read this article. Can I still get sued? A: Yes. The law applies even if you weren’t aware of it at the time you violated it. Q: Can I call the cops and have them arrest my trainer for violating the statute? A: No, the statute is civil, not criminal. So, even if you call the police to report the matter, they will advise you that it is a civil matter and that you will need to pursue the matter in court.